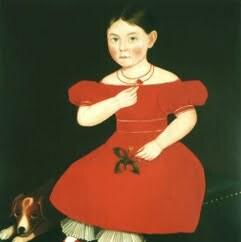 Ammi Phillips was an American itinerant portrait painter active in Connecticut, Massachusetts, and New York for five decades. After his death he was forgotten for decades until his oeuvre was reconstructed by Barbara and Larry Holdridge, collectors and students of American folk art, with the eventual support of Mary Black, art historian, after many friendly arguments and challenges to prove their contention that Phillips was not only the Kent Limner but also the earlier Border Limner. The Holdridges' extensive search in three states for Phillips paintings and for biographical details to be found in the Census Bureau and other written records, as well as the fading memories of still-living relatives of the artist and his portrait subjects was triggered by their purchase in 1958 of one of the very few portraits signed on the reverse by the artist: "George C. Sunderland Painted When at the Age of 21 years by Mr, Ammi, Phillips, In the fall 1840."